The wolf mandala is rife with symbolism and meaning. It is one of the most sought-after mandala animals, for good reason. The wolf is a versatile emblem. There are a couple different meanings associated with the wolf, depending on how it is depicted, and other images are easily included to enhance the symbolism even further. Wolf mandalas symbolize resourcefulness, forward movement, continued efforts to evolve and the prudent use of resources. It imparts an ability to evaluate and adapt to any new situation that may arise as you move forward through your life. The wolf spirit animal is extremely intuitive. He reads your mind to anticipate your next move so he can help guide you. The totem wolf symbolizes loyalty to family, friends and partners. Wolves are pack animals who are fiercely loyal and protective against outsiders, or outside influences, that mean harm. The wolf is also a teacher. He helps you draw on your inner wisdom and intuition so you can more easily see what’s best for you. Your ability to recognize people and situations that should be avoided is enhanced by the wolf so that you may move forward on your journey more safely and successfully. The howling wolf emblem, as opposed to the looking or quietly moving wolf mandala, has two significant meanings. The wolf howling at the moon may be about asking for guidance from the Great Spirit. He may be searching for mystical insight to find the best path to his desired goals. This wolf totem is particularly useful when you are doing the same. The howling wolf will strengthen your efforts. It may also represent the wolf’s claim on his territory. Wolves howl to let others know that he is there and they are not allowed to enter. The Celtic wolf mandala represents the powers of the moon. In ancient Celtic lore, the wolf hunted the sun to consume it at sunset. By consuming the sun, the Celtic wolf was clearing the way for the moon to rise in the sky. Wolf mandala images represent people born between February 19 and March 20 in the Native American Zodiac. People born under this sign are passionate and emotional. They are “the lovers” in the Native American Zodiac. These folks need love but they need their space. They are loyal but fiercely independent. When they are away from their loving, nurturing environment for too long, they tend to become impractical, obsessive, recalcitrant and vindictive. Other mandala animals with similar symbolism are the fox and lion. They, too, represent loyalty, leadership, intuition and passion. The lion and red fox are solar symbols; however, the lioness is a nocturnal symbol like the wolf. Mandala art and jewelry that include a wolf totem or emblem impart wolf symbolism in general. You can select a particular image, though, to represent your beliefs and what you need or where you are in your own personal journey. A wolf mandala that includes a wolf howling at a crescent moon with lotus flowers in the circular border is loaded with additional symbolism. The waning crescent moon (left side of the moon visible) represents letting go. The howling wolf symbolizes a request for guidance on your journey. The lotus flower represents smooth, graceful transition through life or, in Buddhism, renunciation. This wolf mandala would be an excellent meditation guide for those who are ready to move forward on their journey. A wolf looking straight on framed within the lotus flower symbolizes smooth graceful transition or renunciation under the loyal, protective watchful gaze of the wolf. These wolf mandala images can be worn as jewelry or used in décor. Both jewelry and décor or wall art can be selected to help you find your way and stay on your chosen path during meditation. 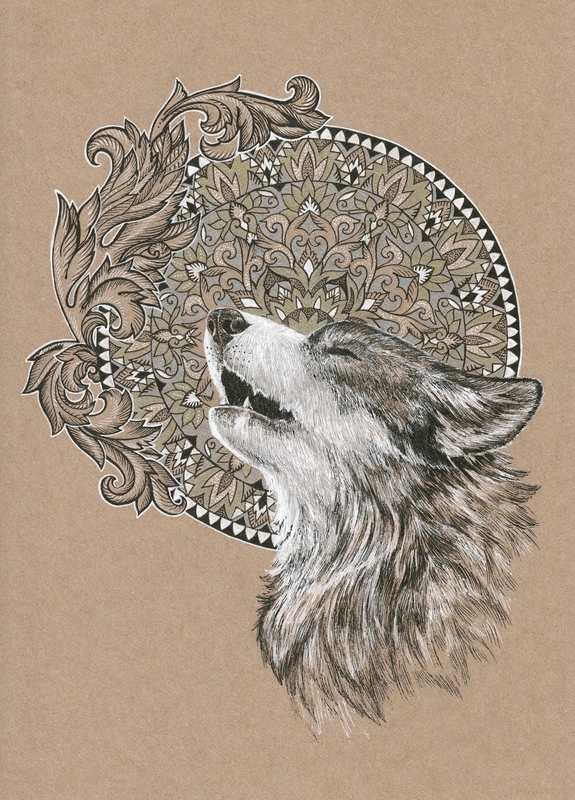 Wolf mandala coloring gives you a wonderful opportunity to personalize your mandala art. Coloring pages are readily available on-line. Simply print out the coloring pages you like and color them in using any colors you choose. Wolf images on the coloring pages can be whatever you prefer or coordinated with your décor. You can use various chakra colors to help you clear and balance your chakras during meditation. Violet and white are crown chakra colors. Purple and indigo are Third Eye Chakra colors. Blue is a throat chakra color. Green, pink and turquoise are heart chakra colors. Mandala art coloring is highly therapeutic. It lets you explore your inner self in an enjoyable way. If you can draw your own wolf, all the better. 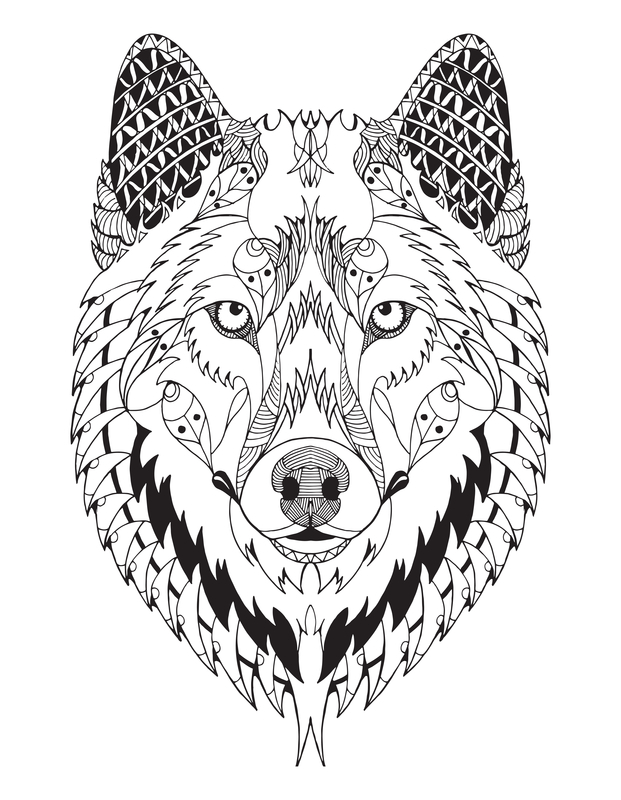 You can create wolf images and mandala designs that are all your own. If you don’t feel that artistically inclined, get coloring pages that only have the wolf and add patterns that include symbols like the lotus flower or crescent moon. Getting a wolf mandala tattoo is a more permanent way to express your strong belief in the wolf and all it represents. As with wolf mandala art, a wolf tattoo can be personalized to reflect your inner self and what you need for your journey. Mandala tattoos are almost always better when they are on a large, flat body surface like the back. The beautiful, intricate patterns of the mandala are easier to appreciate if they don’t wrap around the surface. However, a wolf tattoo looks especially impressive on the upper arm. The mandala design can be scaled down to fit or the image can be wrapped around the arm with the wolf facing out.